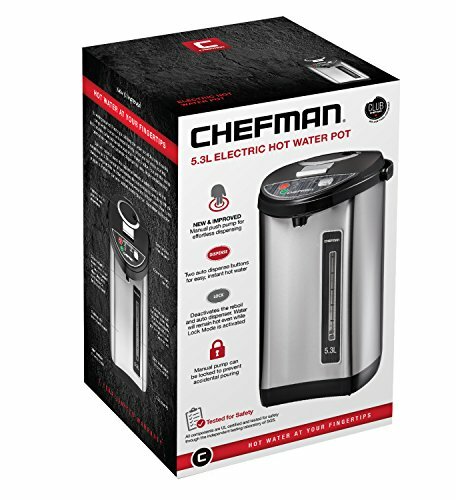 Whether hosting a business meeting, catering an event, or simply upping the convenience quota of everyday life, the Chefman Instant Electric Thermal Hot Water Pot makes it easy to quickly and safely boil and dispense hot water. Keeps water hot throughout the day so you don’t have to wait for the kettle to boil. With a large 5.3 Liter capacity and water level gauge for easy viewing, this hot pot provides maximum efficiency for your hot water needs. Perfect for anything from tea, instant or pour over coffee, hot cocoa, instant soup, noodles, baby food, oatmeal, and more. The exceptionally versatile water boiler can be used throughout the day for various applications. The pot's fold-down carrying handle makes it effortless to transport from the sink for filling to the buffet table or counter when entertaining guests or working in the kitchen. Convenient carry handle and rotating base makes it perfect for parties and more – one less detail to worry about. 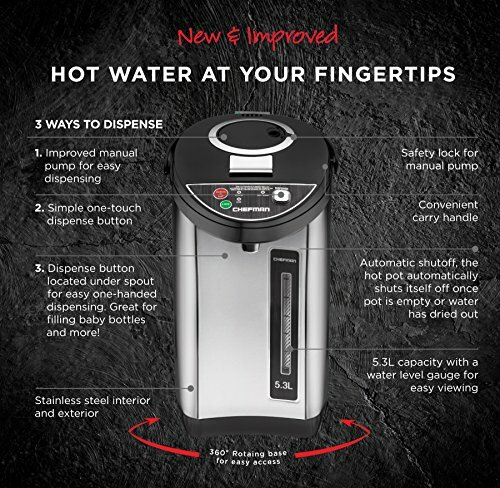 The thoughtfully designed hot pot has two dispense button for easy, instant hot water; dispenses hot water from its built-in spout with a gentle press of the auto button, as well as an easy to dispense manual button. Once the mug, bowl, or other vessel has been properly filled, simply release the button to stop the flow of water. For safety, the hot pot provides a locking lid to prevent spills if it tips over, a locking dispenser that prevents unintended dispensing, and automatic shut-off if water levels get too low. cETL approved with advanced safety technology for long lasting durability with 1 year warranty backed by Chefman. Make the most of your purchase with access to Club Chefman for tailor-made recipes, tutorial videos and more! 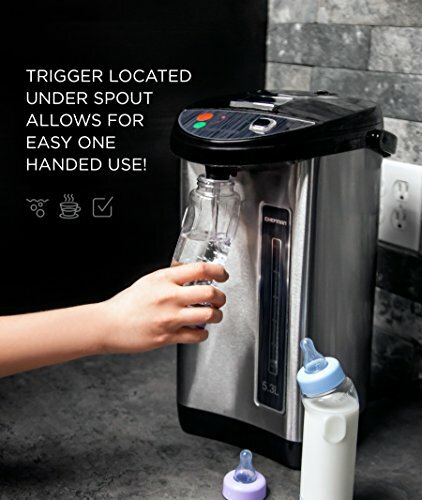 EASY TO DISPENSE: 3 dispense buttons for easy, instant hot water; easy one-handed dispense button under spout for filling cups, water bottles, or baby bottles, auto dispense on the control panel for quick dispensing, as well as an improved manual pump. 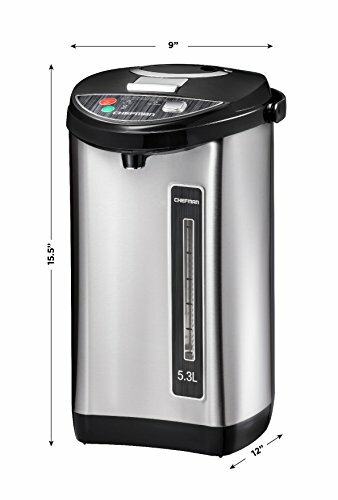 DURABLE & CONVENIENT: 700 watt/120 volt insulated pot keeps water warm and one-touch electronic dispenser with 5.3-liter hot-water capacity provides maximum Energy efficiency, while stainless steel exterior and interior ensure long-lasting performance. EASY VIEW WATER LEVEL: Water level gauge for easy viewing so you can see how much water you are filling the pot with, as well as see when it gets below the minimum line. Convenient carry handle lets you bring this water dispenser with you easily. 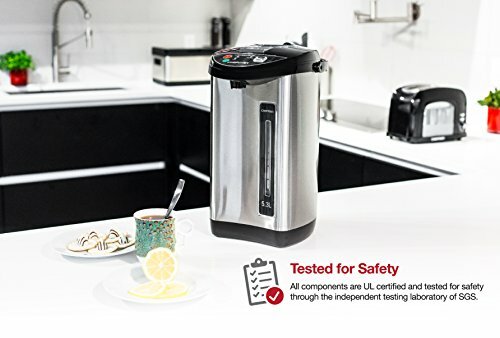 SAFETY FEATURES: The automatic shut-off feature, automatically shuts itself off once the pot is empty or the water has dried out. The hot water pot is designed with a locking lid to prevent spills if it tips over and a locking dispenser that prevents spilling and accidental pouring.